Liguria is the region of Northern Italy where the Alps and Apennines drop steeply and dramatically into the Mediterranean sea. Its lush climate and spectacular landscape make it a true paradise for walkers, gourmands and photographers. On this tour, we’ll follow beautiful trails through the stunning Cinque Terre (“five lands”) region. We will also explore places overlooked by the typical tourist, as one need only head a short distance from the crowds to experience another world. We’ll drive this afternoon in the Cinque Terre village of Monterosso. The five villages are difficult to reach by car, so the best way to explore them is on foot and via the excellent train system, which we will take advantage of over the coming days. 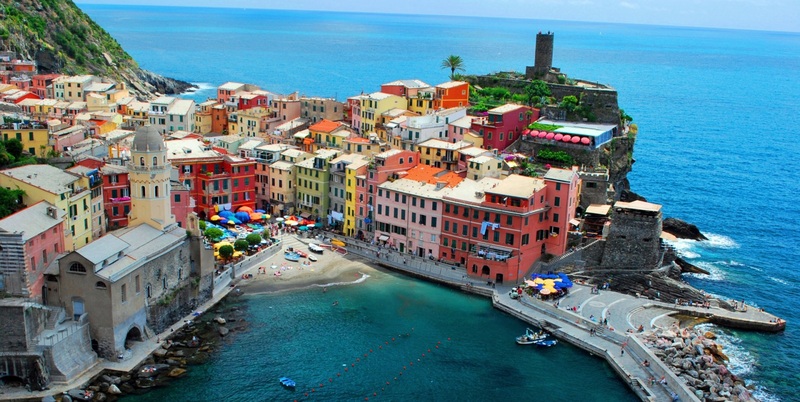 Today we’ll walk to the fishing village of Vernazza, along a beautiful trail sculpted out of the hillside. Perhaps the most beautiful of the five Cinque Terre villages, Vernazza is set around a small harbor, and dotted with pastel-colored houses that seem about to tumble into the sea. We’ll have time to take in the sights, dine on focaccia and branzino (sea bass) at a table in the piazza, and maybe even go for a swim off the little beach, before continuing our walk towards Corniglia, the next of the five villages. Set upon the summit of a jagged cliff directly above the sea and surrounded by steeply terraced vineyards and olive groves, Corniglia is not as well-known as Vernazza, but is just as charming. We’ll enjoy an aperitif as we view Manarola and Riomaggiore, the final two villages of the Cinque Terre, further along the coast. A special hike and lunch is planned for today, in one of the region’s best-kept secrets… non-disclosure agreements must be signed, naturally, but we’ll seal the bargain with a sip or two of a fabulous local passito dessert wine. While our luggage departs by van, we'll travel by train to Santa Margherita Ligure, and from here enjoy a splendid walk through the Portofino Promontory Natural Park, finishing at the tiny harbor of Portofino. In the afternoon, those interested in learning more about Ligurian cuisine can spend time with a wonderful chef (and a real character) at his restaurant, help him pick aromatic herbs and vegetables in his garden and assist him in his preparations of local specialties. We’d then relish the fruits of our labor over an early dinner, before continuing onward by van to Malpensa airport.